Thank you for taking the time to look over this annual report. 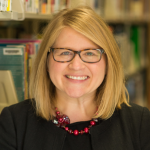 I am Cindy Mack, and I have been the Director of Brighton District Library since August 2016. I am proud to be here, leading a vibrant library in a community that values it. Warm acknowledgements are due to my predecessor, Dr. Nancy B. Johnson, whose leadership made it possible for the Library to weather the recession while maintaining outstanding services for the community. The events that have had the greatest impact on the Library in 2016 go back to the end of 2015. The Library paid off the 1996 bond issue that financed construction of the Library building, and district residents voted overwhelmingly (72% Yes) to levy for Library operations the .22 mills that had been assessed for those bonds. That increase in funding allowed the Library to move forward with many projects in 2016. Our hours of operation, cut since 2011, were restored to their pre-recession levels. Budgets for the materials collections were increased by about 40%. A complete renovation of all the building restrooms was begun, and at the end of the year $300,000 was set aside for the further renovations needed throughout the building, including carpeting, furnishings, and more. Further details about the Library budget and finances are included below. I am excited to be here, at the beginning of a new phase of renewal and growth for Library facilities and services. Our mission is to connect you to the world, and I invite you to come and see the many ways we do that. Note: The Library’s Fiscal Year runs from December to November. Figures throughout this report are for the period December 2015 – November 2016. After 20 years of service, Jeannette Hill resigned from the Brighton District Library Board of Trustees in 2016. When she first started, the Library was a new building with empty shelves and now things have come full circle with a new millage and a new director. We are grateful to have had Jeannette as a vital part of the Library. 2016 was an election year for the Library Board of Trustees. Congratulations to Patrick McDonald, Arla McPeek, Rich Perlberg, and Jordan Genso, who were each elected or re-elected to a four-year term. Please see the Trustees webpage for more information about the Library’s governance and current budget. We also offer our heartfelt thanks to Margaret McDonald, for her outstanding service to the Library. Margaret left the Board in December 2016, following her decision not to seek a new term. She has been a trustee since 2011, and has been a reliable advocate for improving library services to our community. The Library maintains collections of over 114,500 physical items, including books, DVDs, audiobooks, newspapers and magazines, music CDs and more. Over 11,000 items were added in 2016. Our online materials collections, (more than 13% of all checkouts) including eBooks and audiobooks, and video to download or stream were substantially increased with the addition of the Hoopla service. Our online collection numbers nearly 500,000 items and all are available at no charge to our resident cardholders. Full online access to Consumer Reports and Morningstar Investment Research were added to our wide array of online database subscriptions in 2016. Almost every day there is a special program at the Library for kids, teens, or adults. Library programs encourage early literacy, entrepreneurship, creativity, curiosity, and fun! Annual favorites are our Springfest and Holiday Open House celebrations, Summer Reading, and the Parenting Resource Fair. Concerts, films, book discussions, storytimes, genealogy classes, writers workshops, crafts, science programs, and counseling for job seekers and business owners are only part of what round out our offerings. Visit our events calendar at brightonlibrary.evanced.info/signup for a look at all of our upcoming programs. In an Average Month: 2554 public computer sessions, 922 individual Wifi logins. Technology is essential to making connections today, and the Library offers dozens of public computers with speedy Internet, Office software, and printing, scanning, copying and fax services. Every day Library staff is there to help people find their way in the wired world. In an average month in 2016, people logged 2,554 sessions on Library computers, and 922 individuals connected to our Wifi network. The Library also now offers mobile hotspots for checkout. These handy gadgets allow the user access to Wifi as long as there is cellular coverage. This provides the Library with another opportunity to help bridge the digital divide. 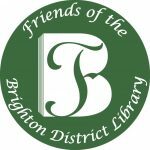 The Brighton District Library has fostered partnerships with area businesses, agencies, non-profits, clubs, and organizations. Together we extend our reach to provide a greater impact to our community. Some of the more prominent of these for 2016 were Livingston County United Way, Greater Brighton Area Chamber of Commerce, Brighton Rotary Club, Livingston Diversity Council, Great Start Livingston, Livingston Promise, Brighton Ford, and C. S. Trojan & Associates. We thank all the individuals and businesses who help make our Library a better place. donate over $28,000 annually to help fund Library programs, the Sandy Schneidewind Books for Babies program, and online databases like Mango Languages. During the recession, the Friends often donated as much as three times the funding we received from the State of Michigan. We are truly thankful for our Friends! To become a Friend, visit brightonlibrary.info/fol. ♦♦♦ The Library would like to give special recognition to Library Trustee Sally McKee for her leadership gift designated for maintenance of the Library aquarium. This extraordinary contribution is given in memory of Bill McKee. The Library would like to extend a special thank you to an anonymous donor family for their gift of autographed copies of The Christmas Humbugs by Colleen Munroe, given to children attending the 2016 Holiday Open House. ♦♦♦The Library would like to express our gratitude to Sally McKee for her generous gift in sponsorship of the Library aquarium, in memory of Bill McKee. ♦Linda Speck, in honor of Elizabeth Michels, M.D. ♦Susan Urban, in memory of Don Urban, Jr.